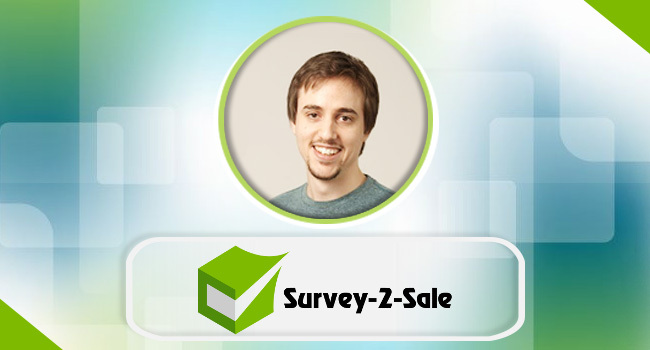 Trevor Page is the creator and founder of a brand new start up called Survey-2-Sale. It's a widget based app that taps into sales psychology to increase conversions. Trevor a second generation coder has been coding since the age of 10 yrs. when he created his first game. Since 2012, Trevor has been a full time entrepreneur. Paul Clifford: On today’s show I have a young gentleman called Trevor Page who’s joining me to talk about his new start up which is called Survey-2-Sale. It’s an amazing little app and I’m not going to go into great detail. I’m going to let Trevor explain it to you. Essentially it’s a tool that really increases the sales on any website, right? Trevor Page: That is the gist. I managed to solve that age old problem of I need more customers so I’m happy to talk about that today on your podcast. Paul Clifford: That’s awesome. Tell me a bit about yourself? When did you get started? I think you’ve always been a coder, developer. That’s your passion at heart? Trevor Page: More or less from birth. I was introduced to coding at a very young age. My father grew up as a coder himself so he passed that down, passed the torch on to his son. I’ve been doing it pretty much since I was about 10 years old, fell in love with it and went through the whole typical path of going to university, learning through computer sciences what I took in university, graduating, getting a job. Then around probably late 2012, I decided to quit my full time job as a programmer. My nice cushy office job and decided to throw myself into this completely unknown world of entrepreneurship. It’s been fun so far. Paul Clifford: I got to ask you, what was the program you wrote when you were 10 years old? Trevor Page: Oh my God! That’s a good one. I’ve never been asked that question. Probably it was a program that at the time … I’m a complete nerd so I don’t know if your listenership will even know what the heck I’m talking about but who knows. I was a nerd. I was really into what they called bulletin board systems, BBS when I was a young. There was a game that was on these bulletin board systems called Lord Legend of the Red Dragon. All it was, was it’s a text based role playing game and I fell in love with it. The problem with these BBSs is that you had to call in with your dial up modem and if anyone else was on at the time you just got a busy signal. It was very difficult to dial in to these BBS systems. I said, “I’m tired of waiting to play my game. I’m just going to make it myself.” I think that was my first program that I created which was a text based Legend of the Red Dragon game on … I think it was a Q basic programming language. Good question. Paul Clifford: Yeah. Well I was pre-used. I was I think 1200 baud, B-A-U-D I think we called it. Trevor Page: I had the 2400 baud when I started as a youngin myself but then I upgraded to the 56k so good times. Paul Clifford: Then the compression came in and you had … I wonder if GZip compression actually came in about that time because compressing the data … because the physical technology was obviously a lot slower. People came up with the software technology to compress data to send it over the modems so you can actually get more data across. Paul Clifford: Obviously the compression went into the modems themselves and then of course once you got up to ISDN, when those days came out internet came in and obviously we know the history from there. Paul Clifford: That’s fascinating, isn’t it? Don’t get me talking about my inner geek. Trevor Page: I know. That’s what I’m trying to … literally biting my tongue because I don’t want to go down this rabbit hole that we’ve started. We’ll stop here. Paul Clifford: You obviously been in development a long time and even started up a blog and started to teach other people how to development in Java, right? Trevor Page: That’s correct. I learned that I was a decent teacher. Usually I say it was when I was in my job but my mom always said that I was a good teacher and I never actually listened to her because it’s your mom and they always try to encourage you. I didn’t listen to her but I realized on my own in my professional job that I was a great teacher because I was bringing these junior programmers on board very, very quickly onto my team to the point where I can leave them alone with a problem. I can just throw a problem at them and say, “Hey so and so I need you to fix this.” and I can come back at the end of the day and be confident that they fixed it and fixed it correctly. That was interesting for me to stumble upon. I decided to take this skill and apply it to this new entrepreneurial venture which I started with a programming blog and put the 2 together and it took off. It went very well. I got picked up by a big name in the industry. Lifehacker.com published an article about me and literally got 10,000 hits within the first few hours of being on lifehacker. It was insane. Ever since my traffic has blown up from that point and I’ve seen a lot of great comments, great feedback from people who are going through learning from my materials on my blog. I even went forward and actually just took most of that content and put in some unique content and published a book too. I went the book route, published that on Amazon and even started a video tutorials website based around the exact same topic teaching people the Java programming language. It’s been fun. Paul Clifford: That’s brilliant. You’ve done a whole load of things. The book, that must have taken some time putting all that together right? Paul Clifford: Got it. You know which is really interesting because there’s so much material out there. I think anyone who wants to start up anything can probably find the information but being able to communicate and train and educate people I think that is where the real skill is. Being able to communicate and bring people forward in their learning and you obviously have that because I’ve seen your site and I’ve seen you get lots of great feedback. Tell me a bit about lifehacker? That was great to get exposure there but was there any specific things you did to actually get published on there? Trevor Page: Absolutely. Great question. I literally just reached out to them. I was trying to find ways to just tell them that my blog existed. I went into my repertoire of websites that I visited and I cross referenced that with my teaching materials. I said, “Okay would this website that I visited on a regular basis, would these guys be interested in publishing my stuff for their readers or listeners or whatever?” When I found a match, I just went on their website and tried to find a way to communicate with them. In the case of lifehacker, there was a little thing at the bottom of the page that just said send us tips. You just send an email to tips at lifehacker.com, and you know a short little email, I kept it nice and concise. I said, My name is Trevor. I just created a new blog or I am in the process of creating a new blog. I teach people how to program. I know that you have published articles about programming before. I think this stuff might be of interest to your readers and that was pretty much it. It wasn’t anything fancy and within I think it was a month later without any sort of notification, without any emails back and forth, it just all of a sudden appeared on lifehacker.com this article about my howtoprogramwithJava.com blog so it was quite a surprise. Paul Clifford: That’s brilliant. Literally just reaching out to them. That’s great to hear and I think for many people that are probably sitting there thinking I’d love to get published on something like that and probably don’t even think about doing the obvious just trying to contact them because I think many people would think, “Well I'll just never get exposure there.” I guess the lesson in that is just to go out and do it. You have nothing to lose. You just need to spend some time finding the right way in and send them a really good strong email. Trevor Page: I mean to add a little bit more to that so this is now … I mean that was great. That was fantastic. That worked out well for me. I tried to repeat that same thing across many, many other websites probably 20 or so that I contacted after that and I don’t know it’s like they can smell it or something. They can smell the sales pitch or something in your email because it never worked. It never worked for any of the next 20 websites that I contacted. It could be that the 21st people I messaged would have picked me up and gone with it. I think it’s just like you said, you just need to reach out and if it works, it works and if it doesn’t you just can’t beat yourself up about it. You just got to keep on going. Paul Clifford: So it’s a numbers game. Trevor Page: I'd tried many, many tricks. If you want me I can talk about the tricks I tried that failed. There’s plenty of those. It’s your call. Trevor Page: One thing I tried … I tried heavily was to, and maybe this is the fault of mine, I was trying to get republished on lifehacker. I tried reaching out to the original gentleman who published an article about me through Twitter. I tried to establish a relationship with him in terms of thanking him for the initial post. Telling him a little bit about my story and how he more or less changed my life with that one article. He responded and he was very positive. He said, "That sounds great. I’m so happy that I could do this for you." Then it was jab, jab, jab and then when I went for that right hook and introduced him to this new venture I had, nothing came of it. Maybe I didn’t throw enough jabs before I tried to sell him on this new venture I had, who knows but that tactic didn’t work out well for me. One more I tried was I had my customers or at least my fans of my stuff reach out to lifehacker through the same medium that I did. Sending it to tips at lifehacker.com and just using honest feedback, they sent messages to them saying, "Hey, this Trevor guy has great content. I love it. I’ve never seen anything as good as this anywhere on the internet." They were trying to get my video tutorials course on lifehacker that’s the whole reason behind it. I probably had 50 people email lifehacker all with fantastic things and still nothing has come of it . That was probably late 2013 that that happened. It’s been over 6 months that I haven’t seen anything come of it. I tried but there you go. That’s obviously an approach that doesn’t work either. You got to be in the right place at the right time it seems. Paul Clifford: It could be simply your first thing was a course and it was something that they wanted to talk about at that time. It was probably hot. They don’t necessarily want to talk about that again and again. It could literally be that. Trevor Page: That’s the takeaway. You can iterate on that and maybe sniff out some other websites that are talking about your type of material, whatever it is your material is. If you have the suspicion that they may talk about it soon then reach out to them. A little bit of research goes a long way. Paul Clifford: Let’s talk about your new start up because I’m really excited about that because I’ve seen that a couple of times. Funny enough it was something I was thinking about doing last year. Obviously never got around to it, but not quite the same obviously, but one of the great tools and great businesses around now is called Qualaroo. They’re really good at trying to identify with the people at the other side of the website both using online questionnaires and things like that. I’ve done surveys and things to my audience but to actually get people and to entice people to give you that data is really quite hard work. So you’ve kind of taken that concept or that idea and then twisted it and made it really work. Perhaps you’d be better off explaining it. Trevor Page: Absolutely, sure. I would absolutely love to. You hit the nail on the head there. I had the same sort of thought. I wanted to survey my audience with one of my products that I was building up. I knew that if I just reached out and cold emailed them and asked for a survey or if I put a survey on my website, you’re going to get a low response rate. You just know it going into it. You need to give them a reason to fill out that survey. I call it incentivizing the survey. I racked my brain over how I could incentivize this survey to give them something to make them want to fill it out and I landed on a coupon code. I created this little widget that asks, your first survey question that you want to ask your audience, and it entices them with this little bubble that says you can save x amount so whether it’s $5 or 10% or $50 whatever you like it’s right there in front of their faces. So this thing pops up and it’s not intrusive. It’s in the bottom right hand corner. It’s nice and out of the way. It slides up and doesn’t take up a lot of real estate on your screen but it’s enough to capture their eye and they see this first question. And the first question could be something very simple like how did you hear about us or what’s your age range or I don’t know whoever, whatever it is you want to ask your audience. They see that little bubble that says save 10% and they say, "Oh interesting. I can save 10% off of this product if I just give them this one little answer." They’ll say, "Okay well I heard about you on Google. I’m willing to give up that information." Then they say next. But then what happens is the magic. The save 10% bubble gets bigger or bubbles up and it changes from say 10% to say save 15% and the second question is on the screen. Now they’re hooked and I’ve seen this work over and over and over again. They want to see how much they can save because it’s this psychological trick or technique of … it’s not a bait and switch but it’s this reward that you can gain and you’re working towards it. So you’re working towards this reward that you don’t know how far you can get with and it’s almost like gamification. They’ll fill out the survey and at the very end you give them their reward, their coupon code and because they put in this effort to attain this coupon code, they’re much, much, much more likely to redeem the coupon code and purchase your product than if you were to just flat out offer them the coupon code without them giving any work in return. It works really, really well. For myself personally, I’ve seen an increase month over month now. Every single month I’ve seen this an increase of 200% in my sales since before I installed this widget. It’s been 3 months running because it’s a brand new widget but for 3 months I beat my best sales month ever 3 times in a row now so it’s quite exciting. Paul Clifford: That’s brilliant. Essentially doubled your conversation rate. This tool will double your conversation rate and obviously pay for itself within its first month obviously depending on what your product is. Trevor Page: My product, I was selling an ebook for $15 and I was receiving maybe around 1000 to 1500 visits to my website a month. Relatively speaking for myself, that’s not a very high volume or high traffic website and it’s a fairly low price point. I was able to double my sales and absolutely within the first 2 weeks I would have technically paid off the license cost for Survey-2-Sale for the entire year. I would have paid it off in the first 2 weeks. It’s quite effective and I’ve seen this sort of … and that's just myself, I’ve seen this sort of … these results from my customers that actually use it. One of them is John Dumas. Do you know him from Entrepreneur on Fire? Paul Clifford: Oh yeah. He’s a great guy. Trevor Page: He’s awesome. He’s been a very big supporter of myself and the Survey-2-Sale widget. He installed it on his product page where he sells membership to Podcasters Paradise, his mastermind group. Before installing this thing, he was seeing more or less $0 in passive income for his sales. Most of his sales occurred on webinars. It’s very non passive sales funnel that he had. So then he was interested in the Survey-2-Sale widget because I'd sent him a video explaining what it's all about and he was very excited. He installed it and within the first month of him using it, he went from more or less $0 in sales to $12,115 in sales. Just incredible results. I would never have guessed that it would have worked that well so I’m quite excited. Paul Clifford: That’s brilliant. So this has just launched, right? I think you went live, was it last month? Trevor Page: Yeah. I went live … John Dumas was pretty much my first real customer and that was February 1st. He went live with it. Paul Clifford: Wow that’s brilliant. How is it coming along so far? What are your plans for the tool? Trevor Page: Right now I’m more or less I’ve done my, you know I'm past my minimum viable product stage. That’s great. That’s a goal that I’ve hit which I’m very excited about. Now I’m just implementing the new features that all the customers are asking for. Things like integrating with other email delivery systems. Right now it integrates with AWeber. It integrates with Office Autopilot and MailChimp. You can actually automatically grow your email list with this tool as well because you can ask the question on your survey … you can say what is your best email address and when they type it in, you can have it linked directly up to your email delivery system and you can get those people right into your automated sales funnels. That’s another cool thing that this widget does as well as one feature that John had asked for. He wanted a countdown timer at the end of the survey. I was like, “Oh that’s a great idea.” I threw in a countdown timer a well. It count downs whatever you like however many minutes or seconds or days or whatever you want to give. It will countdown from 10 minutes saying you’re coupon code will expire in … it just causes that urgency to seal the deal when it comes to the sale. It’s nice. It’s cool. Paul Clifford: Absolutely. The scarcity value, the Robert Cialdini principle. Trevor Page: Oh I love his book. Trevor Page: I’ve got it right behind me. I read it cover to cover. Great stuff in there. Paul Clifford: It’s one of the cornerstones of every marketing bookshelf. Paul Clifford: I went to see him live actually in New York once. It’s very inspiring stuff. That’s cool. You’ve got a good roadmap coming. Tell me about traffic. You got some experience in getting traffic to your other sites. What are you going to do in terms of getting exposure to this, obviously there's my podcast and that’s going to get you some customers, but in terms of general traffic strategy what’s your thinking around that? Trevor Page: There’s the obvious routes like embedding a blog and giving away great content on the blog. That’s something that I think is a cornerstone for any traffic generating strategy. But one thing that I’m doing now that’s nice because I can do it with this app is that you can have a link inside of the survey itself. So you can have your little branding on the widget to say powered by Survey-2-Sale. That generates 33% of my overall traffic that comes to my website right now. Having that little logo on there is very good when you are on a customer’s website who is customer based are also your customer base. A good example of that is John Dumas. He sells his products to entrepreneurs and entrepreneurs are my demographic. Because he has this widget on his website and other entrepreneurs are seeing it, they see it, they realize the value in it and then they want to know how to get it themselves so they click on powered by Survey-2-Sale and that’s how they land on my website and become customers. That’s one cool strategy that I’ve implemented that seems to be working really well. Paul Clifford: I guess you’re doing guest posting and content marketing on other blogs as well? Trevor Page: I haven’t done that just yet. Right now, because I am sort of fresh out of the gate, my initial strategy is like you said, I’m going on podcasts, getting the word out that way. That’s been my main sales driving factor if you will but eventually once I get my blog up and running then I’m going to go into the guest blogging and what not. Although what’s interesting is I just received a message from … I signed up for Neil Patel’s traffic lead program with Quick Sprout I think is what it’s called. He just sent an email whether or not it was in his automated funnel or not or if it was a live email that he just sent today, I don’t know. He was talking about guest posting and how that is becoming something that you should be a little bit wary of. It’s almost like guest posting is becoming today’s blog comment spamming type thing. There’s only so far you can go before you start to actually get penalized which was something that was very shocking to me. I had no idea that that was turning into that. I don’t know if you ever read anything about that topic or not but I literally read it today and I thought well I should talk to someone about this. This is interesting. Paul Clifford: Well what’s interesting … I don’t know when you got that but … so I had a conversation with Neil about that topic because that was on the back of an announcement that Matt Cutts recently made about the fact that they’re going to look at introducing a penalty filter on guest posting, guest blogging. What it's geared towards is since guest blogging became popular, there was like an army of automated tools and automated content generators and in fact not all of it was automated in terms of the content generation but the point is that a lot of guest posting, guest blogging was done just for link acquisition. Trevor Page: And that comes across when you’re lacking quality, really is what ends up happening and that’s what Google is trying to avoid. I would assume. Paul Clifford: Absolutely. Google’s principle is that they're obviously trying to avoid … is they call it gaming the system. Of course, everyone in the whole world wants to know how to get more exposure on Google so you’re going to try different tactics and techniques. What might be white hat today might be black hat tomorrow. There’s a lot of ethical work that was going on but it’s just not going to work in the future. Is guest blogging going to go away? No. It’s not at all and I think the key thing that people should focus on is producing the best quality content they can. Every bit of content that I put out, I mean a lot of it is podcast, videos and things like that, but I invest a lot of time in making sure that content is the best it could possibly be because it’s evergreen. It lasts forever and it’s your voice out on the web. Whether it’s used for a guest post or whatever I want to make sure that anyone touching that comes out of it with a good quality experience. Either they’ve learned something or however it might be and I think if you focus on that and when you reach out to communities and blogs to guest post on, that you’re focused on their audience and their traffic rather than the links. If you go at it from a traffic perspective and make sure your adding value, is good quality content, and if you’re thinking that way and reach out to people that way, then you’ll continue. Having a post on someone else’s blog with a back link, that’s just not going to get penalized because that’s the essence of the web. Paul Clifford: That’s the way everything works. That’s not going to get penalized. They will know and they will develop their algorithm to look at the volume people and that’s where the risk comes in. I don’t know if Neil has published something recently but I know that we had a discussion on guest posting at that time when I interviewed Neil. We agreed on that point and that’s the big thing. Guest posting is not going to die but you just need to focus on it for traffic rather than links. Trevor Page: Also what was mentioned in the article that he said was the relevance. Whatever it is that you’re posting about, you’re doing your guest post about should be relevant to what the website talks about in general. I think as long as you can stay on the course that way then that will certainly never be a bad thing. Paul Clifford: Absolutely. Great. It sounds like you got a great product. You’re focused on that. You got a traffic strategy and a really neat one I think with embedding your logo as well. That’s got to be really, really cool. If anyone’s listening to this, then they can go to, is it survey2sale.com? Trevor Page: Yup Survey-2-Sale could be the number 2 could be the word to, T-O. I’ve purchased all the domains so you should be able to land on the right page no matter which one you type in. Paul Clifford: Good. Well you get a thumbs up from me because so many people forget to do that. It’s one of the things that … I always teach in my communities is that if you come up with a name and you think it's a really good name, for God’s sake buy all the domains. Don’t just buy the .com. Trevor Page: Yeah. The test I did for that if this is helpful, hopefully it is for your listeners was when I told people the name of my product or my website, I would tell it to them once and I’d say write it down and I looked at what they wrote down. It’s incredible the different variations that you see that they write down. So that led me to purchasing survey dash the number 2 dash sale.com. I purchased survey to sell, S-E-L-L.com perhaps there’s a southern accent going on in there. I don’t know. It was a really interesting exercise for finding out just from saying, “Here’s the name of my product, now write it down” what comes out of the mix. That’s a good strategy for buying domains. Paul Clifford: You bought the .net, the .org and you don’t have to buy necessarily every single one at least all the mains ones, right? Trevor Page: The mains ones. I didn’t buy all the nets and orgs and all that for every single one but the main one exactly for sure. Paul Clifford: Because you do get people out there piggybacking your brand and I hate that. I guess trademarking as well. Once you settle on a good name and a brand and you want to really back it, then you should trademark it as well. Not for the obvious reasons, there are a lot of people that think, "You got to trademark it in case someone else publishes something and you want to sue them." At the end of the day not a lot of people … it’s not about suing because that’s a big exercise and there’s a lot of money involved. It’s more what I find is if someone publishes say a YouTube video, that's talking about your product in a negative way so in other words defamation, you want to get that removed and if you got a trademark it’s really easy to fill out the form with Google on YouTube with your trademark number and it will disappear the next day. Trevor Page: Incredible. I didn’t know that. There you go. Paul Clifford: As long as it's defamation you know what I mean. It’s got to be a negative video. If someone is just reviewing it with authority then that’s different. There’s a lot of videos that go up who’s just trying to piggyback your traffic and the easiest way to get that removed is to fill out the form with Google and you’re in a lot stronger position to do that if you've got a trademark. Trevor Page: Good to know. Paul Clifford: There you go. Tip from Paul today. Trevor Page: Yeah pro tip with Paul Clifford. Paul Clifford: Listen Trevor I really enjoyed having you on the show. I think for anyone listening it’s a great tool. You can get it at Survey-2-Sale. You probably got it running on the site so you could probably see it. I think you got a free trial going, haven’t you? Trevor Page: That’s correct. Everything you said is correct. You can get a free trial. Actually I just introduced recently a 14 day no credit card required free trial so there’s very low barrier to entry. Get it on your site, get it set up and see how it works. See how it goes, see how you like it and then if you like it, you can sign up for the paid versions. Paul Clifford: Excellent. Great Trevor. I really appreciate you coming on the show. Thanks to that. We’re going to keep in touch and for any listeners, who want to get hold of you Trevor then I guess go to Survey2Sale and fill out the contact form and have a chat. Paul Clifford: To everyone listening to the show, Trevor and I are running a contest. Essentially all you have to do is leave a comment in the comments box below and let us know what question you would like to ask your audience. In other words whenever someone hits your site or looks at your product, what is the one question you want to ask them? Leave that in the comments box below and we will pick 2 winners by the end of the month. Each of those winners will win an annual license to Survey-2-Sale. That’s worth $648 to you so you can actually put this into action and increase your sales for absolutely nothing. All you have to do is leave a comment below. We will choose the winners and we’ll let you know at the end of the month and you could be a winner. The most powerful question I could ask is what are you currently working on? The best way for me to make sales is to connect with my audience – and by figuring out where they are before they buy – I can serve them better. For instance, how many of them already have a business, how many are thinking of starting one?